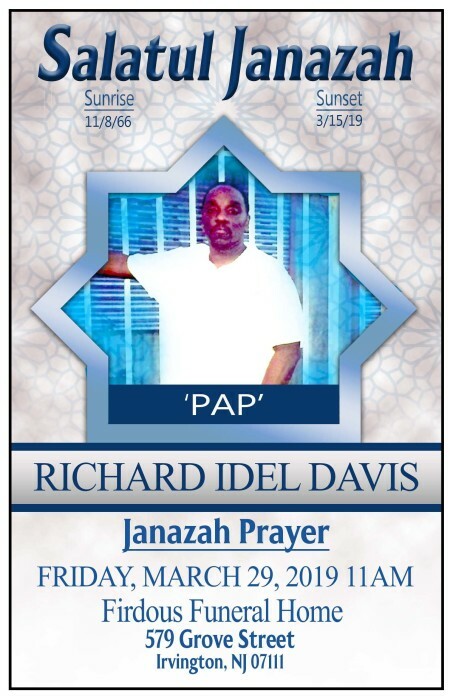 Richard Idel “Raheem” Davis aka “PAP” born to Linda Jean Spinks and Richard Davis on November 8,1966. Raheem attended Alexander St School and Valisburg High School. Raheem leaves to cherish his memory his daughter La Donya, sister Regina Sanders, stepdaughter Ebony Scott and step grandchildren Maziyah, Dayvon and Royce. Nieces and Nephews Daniel, Keyonna, Nazlah, Raheem, Kashif, Faizon and Linda Davis, Nyron and Tyrell Smith, Renee Suter and Atiah and Jeffrey Sanders, Nigel and Wali Hutchins and Rashon Spinks. His fiancée Tawanna King. Raheem is predeceased by his parents Linda Jean Spinks and Richard Davis. Grandparents Earl and Ruth Spinks; Sisters: Thomasina Davis and Renee Davis.